Business cycles represent the slowing down, declining and speeding up of the economy, or more formally, recessions and expansions. The AD-AS model gives us one way to understand business cycles. Recessions occur as a result of negative demand or supply shocks, which cause the equilibrium level of real GDP to fall substantially below potential GDP, as occurred at the equilibrium point E1 in Figure 1. Figure 1. Aggregate Demand and Supply Shift Left. Recessions can be caused by negative shocks to either aggregate demand or aggregate supply. (a) A decrease in consumer confidence or business confidence can shift AD to the left, from AD0 to AD1. When AD shifts to the left, the new equilibrium (E1) will have a lower quantity of output and also a lower price level compared with the original equilibrium (E0). In this example, the new equilibrium (E1) is also farther below potential GDP. A decrease in government spending or higher taxes that leads to a fall in consumer spending can also shift AD to the left. 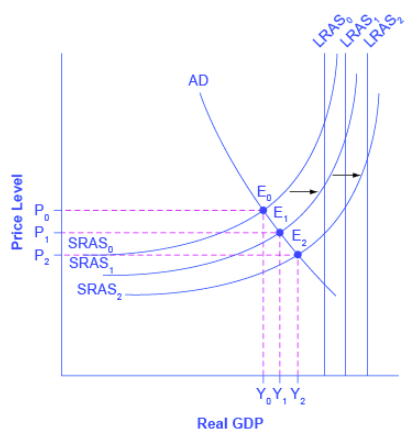 (b) An increase in the cost of critical inputs can shift AS to the left, from SRAS0 to SRAS1. When SRAS shifts to the left, the new equilibrium (E1) will have a lower quantity of output and a higher price level compared with the original equilibrium (E0). In this example, the new equilibrium (E1) is also farther below potential GDP. Recall that cyclical unemployment is unemployment to fluctuates with the business cycle. In the AD–AS diagram, cyclical unemployment is shown by how close the economy is to the potential or full employment level of GDP. Returning to Figure 1 above, cyclical unemployment increases when the output falls substantially below potential GDP on the AD–AS diagram, as at the equilibrium point E0. Figure 2. Rightward Shifts in Aggregate Demand or Supply. 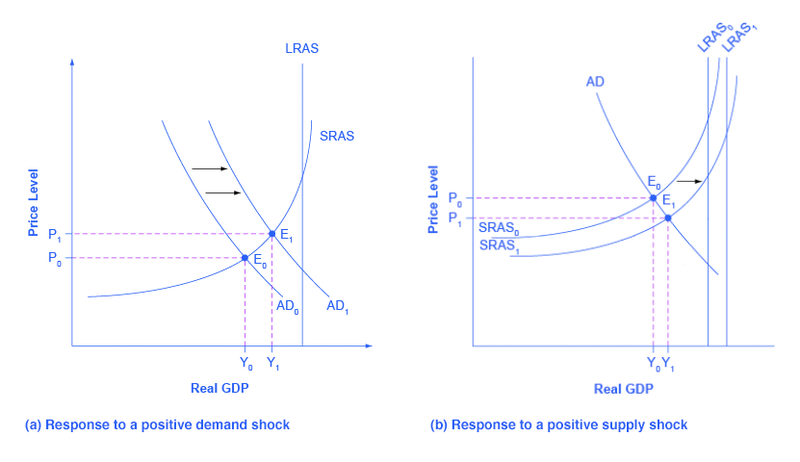 As the economy expands, either in response to a positive demand shock, shown in frame (a), or in response to a positive supply shock, shown in frame (b), real GDP increases, reducing cyclical unemployment. Expansions occur as a result of positive demand or supply shocks, which cause the equilibrium level of real GDP to rise towards, and sometimes beyond, potential GDP, as occurred at the equilibrium point E1 in Figure 2. As GDP rises, cyclical unemployment falls. Inflation fluctuates in the short run. Higher inflation rates have typically occurred either during or just after economic booms: for example, the biggest spurts of inflation in the U.S. economy during the twentieth century followed the wartime booms of World War I and World War II. Conversely, rates of inflation decline during recessions. As an extreme example, inflation actually became negative—a situation called “deflation”—during the Great Depression. Even during the relatively short recession of 1991–1992, the rate of inflation declined from 5.4% in 1990 to 3.0% in 1992. During the relatively short recession of 2001, the rate of inflation declined from 3.4% in 2000 to 1.6% in 2002. During the deep recession of 2007–2009, the rate of inflation declined from 3.8% in 2008 to –0.4% in 2009. Some countries have experienced bouts of high inflation that lasted for years. In the U.S. economy since the mid–1980s, inflation does not seem to have had any long-term trend to be substantially higher or lower; instead, it has stayed in the range of 1–5% annually. The AD–AS framework implies two ways that inflationary pressures may arise. One possible trigger is if aggregate demand continues to shift to the right when the economy is already at or near potential GDP and full employment, thus pushing the macroeconomic equilibrium into the steep portion of the AS curve. In Figure 3(a), there is a shift of aggregate demand to the right; the new equilibrium E1 is clearly at a higher price level than the original equilibrium E0. In this situation, the aggregate demand in the economy has soared so high that firms in the economy are not capable of producing additional goods, because labor and physical capital are fully employed, and so additional increases in aggregate demand can only result in a rise in the price level. Figure 3. Sources of Inflationary Pressure in the AD–AS Model. (a) A shift in aggregate demand, from AD0 to AD1, when it happens in the area of the AS curve that is near potential GDP, will lead to a higher price level and to pressure for a higher price level and inflation. The new equilibrium (E1) is at a higher price level (P1) than the original equilibrium. (b) A shift in aggregate supply, from AS0 to AS1, will lead to a lower real GDP and to pressure for a higher price level and inflation. The new equilibrium (E1) is at a higher price level (P1), while the original equilibrium (E0) is at the lower price level (P0). An alternative source of inflationary pressures can occur due to a rise in input prices that affects many or most firms across the economy—perhaps an important input to production like oil or labor—and causes the aggregate supply curve to shift back to the left. In Figure 3(b), the shift of the AS curve to the left also increases the price level from P0 at the original equilibrium (E0) to a higher price level of P1 at the new equilibrium (E1). In effect, the rise in input prices ends up, after the final output is produced and sold, being passed along in the form of a higher price level for outputs. The AD–AS diagram shows only a one-time shift in the price level. It does not address the question of what would cause inflation either to vanish after a year, or to sustain itself for several years. There are two explanations for why inflation may persist over time. One way that continual inflationary price increases can occur is if the government continually attempts to stimulate aggregate demand in a way that keeps pushing the AD curve when it is already in the steep portion of the AS curve. A second possibility is that, if inflation has been occurring for several years, a certain level of inflation may come to be expected. For example, if consumers, workers, and businesses all expect prices and wages to rise by a certain amount, then these expected rises in the price level can become built into the annual increases of prices, wages, and interest rates of the economy. These two reasons are interrelated, because if a government fosters a macroeconomic environment with inflationary pressures, then people will grow to expect inflation. However, the AD–AS diagram does not show these patterns of ongoing or expected inflation in a direct way. 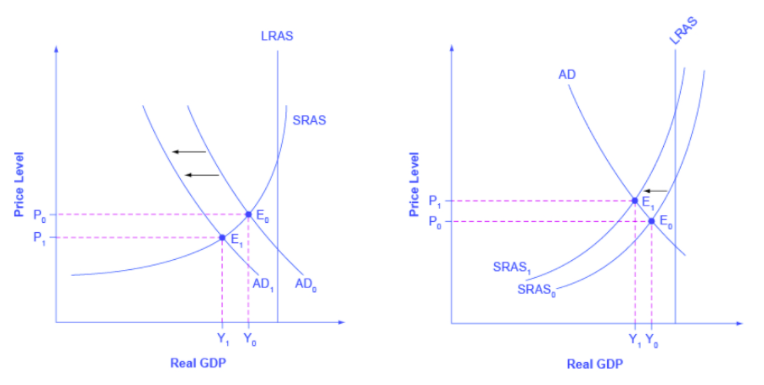 In the AD–AS diagram, long-run economic growth due to productivity increases over time will be represented by a gradual shift to the right of aggregate supply. The vertical line representing potential GDP (or the “full employment level of GDP”) will gradually shift to the right over time as well. A pattern of economic growth over three years, with the AS curve shifting slightly out to the right each year, was shown earlier in Figure 2(b). Figure 4. Economic Growth. The rise in productivity causes the AS curve to shift to the right. The original equilibrium E0 is at the intersection of AD and AS0. When AS shifts right, then the new equilibrium E1 is at the intersection of AD and AS1, and then yet another equilibrium, E2, is at the intersection of AD and AS2. Shifts in AS to the right, lead to a greater level of output and to downward pressure on the price level. However, the factors that determine the speed of this long-term economic growth rate—like investment in physical and human capital, technology, and whether an economy can take advantage of catch-up growth—do not appear directly in the AS–AD diagram. In the short run, GDP falls and rises in every economy, as the economy dips into recession or expands out of recession. What is the level of consumer confidence today? Visit this website for quick look at current data on consumer confidence. Or visit this website for current data on business confidence. Review and summarize these concepts you’ve learned about the aggregate demand-aggregate supply model in the following video. Macroeconomics takes an overall view of the economy, which means that it needs to juggle many different concepts. For example, start with the three macroeconomic goals of growth, low inflation, and low unemployment. Aggregate demand has four elements: consumption, investment, government spending, and exports less imports. Aggregate supply reveals how businesses throughout the economy will react to a higher price level for outputs. Finally, a wide array of economic events and policy decisions can affect aggregate demand and aggregate supply, including government tax and spending decisions; consumer and business confidence; changes in prices of key inputs like oil; and technology that brings higher levels of productivity. The aggregate demand–aggregate supply model is one of the fundamental diagrams in this text because it provides an overall framework for bringing these factors together in one diagram. Indeed, some version of the AS–AD model will appear in every module in the rest of this text.